"Dear Jesse and Tina and family, I'm so sorry for your loss..."
"Dear Jesse and Tina and family, I am so sorry for your..."
Barbara King White, 76, a resident of Zachary, LA, died on Sunday, September 9, 2018 at her home. There will be a visitation on Saturday, September 15, 2018 at the Slaughter First Baptist Church (3227 Church Street, Slaughter, LA) from 11:00am until memorial service at 11:30am, conducted by Rev. Basil Wicker. She is survived by four sons: Jesse J. White and wife Tina Guest of Zachary, LA; Robbie White and wife Marie Hathaway of Springville, AL; Jerry White and wife Anne Keever of Greenwell Springs, LA; Jimmy White and wife Margie Wallace of Ethel, LA; daughter-in-law Madonna White; son-in-law John Heffner; and Janice Laney May and Michael Graham who were like children to her. She is also survived by her sister, Margie Johnson; twelve grandchildren: Marsha White; Samantha Beasley (Brandon), Rachel Gayle (Matt); Jessica Sloan (Connor); Danny White (Brittany); Christopher Banta; Matthew Banta; Darlene Grimes (Taylor); Monica White; Justin White (Jessica); Stephen White (Amanda); Jason Laney (Dana). ; and numerous great-grandchildren. She was preceded in death by her parents, Monroe and Lucille King; her brother Jerry Wayne King; son Stephen White; daughter Brenda White Heffner; and her husband Jesse C. White. 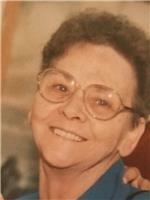 Share sympathies, memories, and condolences at www.CharletFuneralHome.com.